Come join us for Happy Hour next Wednesday, September 26 starting at 5:30 PM at Misconduct Tavern on 1511 Locust Street, Philadelphia. Come and relax after a long day’s work and have fun with your fellow NSA peers. Bring a friend! They have drink and food specials until 7:00 PM every day, the ones for Wednesday are listed below. They also have discounted prices for drafts and other items. Special thanks to Kevin Rafferty for doing the leg work and organizing this event. For more details about the venue visit http://www.misconducttavern.com . Note that there are two locations. We are meeting at the 1511 Locust St location. Please RSVP and let us know if you plan to come. The second meeting of this month (normally set for the 3rd Tuesday of the month at La Salle University) will be held at a different time and location. The new details are: Monday, June 18 – at Bala Cynwyd Library, 1st Floor Meeting Room, 7:00 PM – 8:45 PM. Also, for the next couple of months, all meetings will be held at the Bala Cynwyd Library. More announcements to come regarding meetings on the second meeting of the month. It was a lot of fun! We were 9 people at the picnic. We had two tables next to each other under full shade for the whole time and next to the meadow with a nice view of the arch in the back . 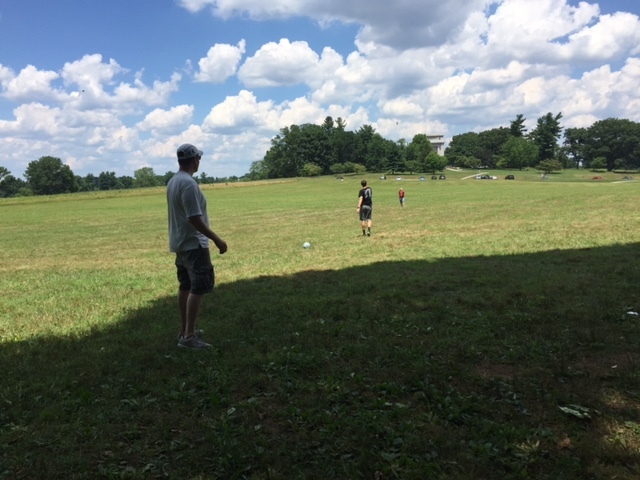 We shared food and drinks, talked, played soccer and threw a football around. There was a nice breeze and the weather was more pleasant than expected. We’ll repeat it next year! There were several workshops led by international attendees, “Speaking Circle” lead by Satu Nygren and Andri Bjarnason from Finland, and “A Mindful Sense of Vulnerabily ” by Anita Bloom from Sweden were two of my favorites. Speaking Circle is a way to practice speaking in front of groups where the speaker has 3 minutes to talk about any topic he/she wants and then receives only positive feedback about his/her delivery. We heard some very good stories and Katherine Filer from the South Jersey chapter was one of the speakers that went up to the podium. But the best part of the workshop was when a 16-year old first-time attendee girl came to the front. She told us how she had been a very outgoing girl when she was young, but everything changed after she started stuttering in third grade and became very shy. After all the rollercoaster of emotions from her first conference, she had gathered the courage to speak in front of our small group of about 15 people. She became very emotional and started crying but stood her ground and stayed on the stage. Anita Blom went to her, hugged her and reassured her, and she was able to finish speaking. Her father was in the audience and by the end of the workshop many of us were in tears, happy and sad at the same time, filled with love and empathy but overall, happy that she was able to take such a big step and that we were there to share the moment with her. The amazing thing is that less than hour after that, we had the conference’s Closing Ceremonies and she came to the stage, this time in front of 800 people, and spoke beautifully to express how amazing the conference had been for her. There were very active workshops such as “Improv for Beginners” and “Creative Movement and Storytelling”. They were a lot of fun. We had to find ways to improvise with movements as well as with words. By the end of the workshop you’ve lost your inhibitions and you are just dancing and moving around with everybody. I went to the early morning Yoga class on Friday and attended a different Yoga workshop (“The Yoga way: Relax your body, relieve your mind”) where we learned about Visuddha and how to do some stretches around the throat and torso to keep those areas relaxed. There were many workshops for children, teens, and 20-somethings, as well as workshops that provide CEUs for speech language pathologist. I attended one of the CEU sessions called “How we talk about stuttering”, led by Hanan Hurwitz from Israel. We discussed how the way you talk about something and the language you use can communicate unintended judgement or meaning and it affects how you view things. Something that stuck with me came from one woman that said that she used to tell people that she had a “speech impediment”. She later realized that by saying “impediment” she was judging her stutter as something bad that creates obstacles, predisposing the listener and herself for bad things to come. She started to say that she just stutters. There is no judgment or hidden connotations, it is just a fact. By doing that, she is not setting herself up for failure and she acknowledges the fact that she stutters without implying anything bad with it. 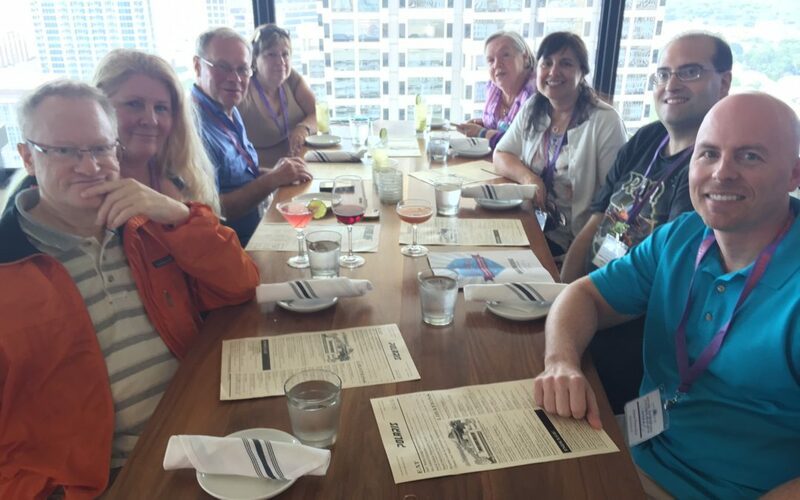 Our founder and past chapter leader, Bill Parry, presented a workshop called “The neurological key to dissolving stuttering blocks” where he presented findings from therapy sessions with his patients and a lot of interesting information about the blocking mechanism, the Valsalva Maneuver. It was very well attended. There were many other workshops and of course a couple of General Sessions. One of the key note speakers was Vince Vawter, a person who stutters and a retired newspaper publisher that recently wrote a book, “Paperboy” about a boy that stutters and has to run a newspaper delivery route to help a friend. It is a wonderful book, short and very easy to read, that brings up a lot of the memories from being a young person that stutters. And of course, the last night we had the dinner banquet, live action and dancing. Overall, it was a lot of fun. Towards the end of the conference, I talked to Tammy Flores, the NSA Executive Directory, about the possibility of bringing the conference to Philadelphia. She thought that it would be a great location and would like to make it happen and she offered 2019 as the first available slot (next year is in Dallas and in 2018 it will be somewhere in Southern California). I am very excited about this and several people have already come to me offering to volunteer to help. It is three years away but it will come sooner that you expect. Come join us for some summer fun and bring family and friends. 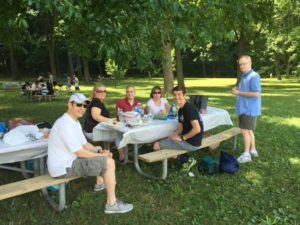 We will be at Wayne’s Woods Picnic Area of historic Valley Forge Park, near King of Prussia on July 17th starting at 11:30 am. Rain date is the following Sunday, July 24. Please RSVP to this email or contact me at gredos@verizon.net and let me know how many people will be coming with you. Bring your own lunch and some food item to share with others: chips, soda, cookies, veggies, etc. Something to play with: Frisbee, football, baseball glove, bat and balls, etc. This picnic area is located on South Outer Line Drive, along The Encampment Tour route, and in between the National Memorial Arch and the General Anthony Wayne Statue (tour stops 3 and 4 respectively). 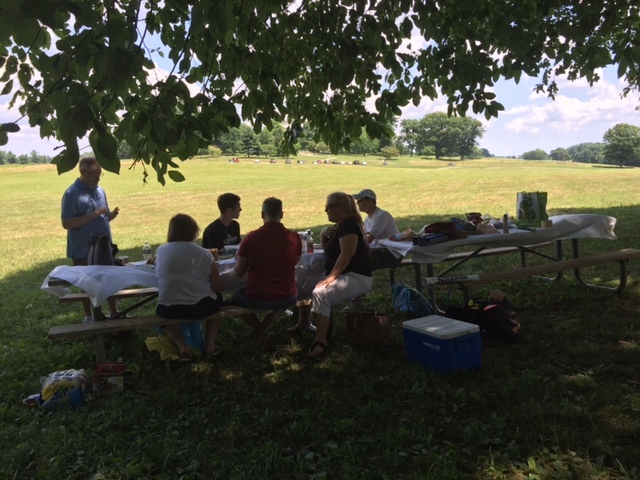 These picnic grounds open up to a large mown field with the National Memorial Arch in the background. Keep right at the fork and follow North Outer Line Drive along The Encampment Tour route. Follow N. Outer Line Drive for approximately 2 miles. Make a right into the Wayne’s Woods Picnic Area parking lot. 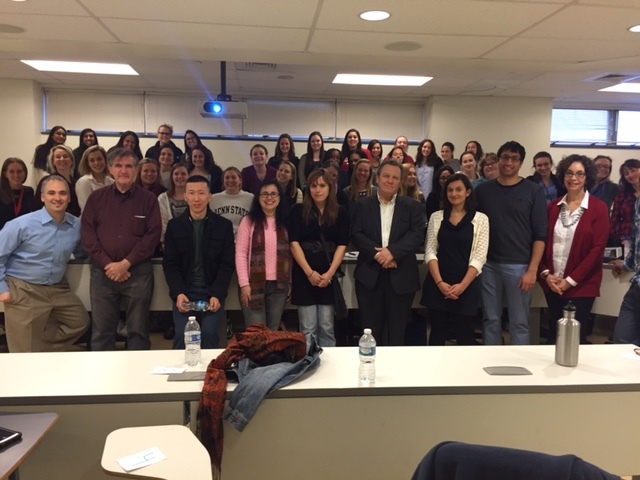 As is tradition at this time of the year, we were invited to participate in the La Salle’s Panel of People Who Stutter lead by Dr Amster and Dr Trichon for their graduate class in Speech Language Pathology. 8 people who stutter attended. We started by introducing ourselves to all the students and commenting on our experience with therapy and stuttering. Then the students broke up in groups of 4 or 5 and each of us spent about 10 minutes with each group. It was a very intense experience because we were talking the whole time. The students had a lot of interesting questions and they were very interested in all aspects of stuttering, such as feelings, techniques and therapy. We thank Drs Amster and Trichon for the opportunity to talk to the students and increase their knowledge about stuttering. If anything we said helps even only one therapist help a child or person who stutters in the future, we’ve done our job.